Shown (l-r) are the candidates for the 84th House District, Susan Manchester and Joseph Monbeck, and the 80th House District, and D. J. Byrnes and Jena Powell. 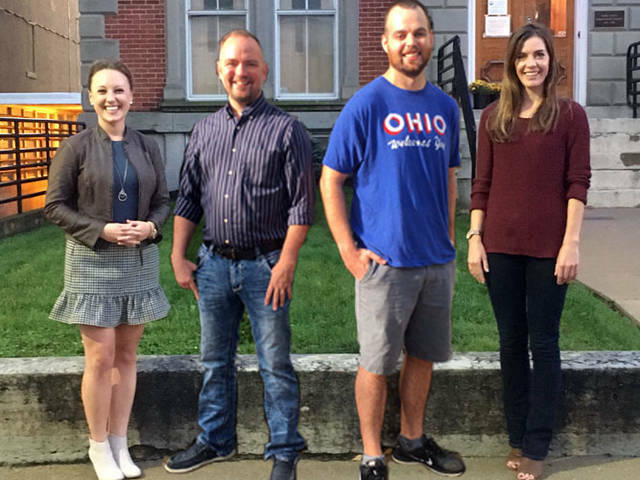 GREENVILLE – The League of Women Voters of Darke County again is sponsoring a Candidates Night from 7-9 p.m. Tuesday at the American Legion Hall on Ohio Street in Greenville. The forum will focus on the contested races for the 80th and 84th House Districts. Candidates for the 84th House District are Republican Susan Manchester and Democrat Joseph Monbeck. Candidates for the 80th House District are Democrat D.J. Byrnes and Republican Jena Powell. The evening will feature the house district candidates followed by information shared on Ohio Issue 1 and the two local Greenville issues. After two-minute introductory speeches, candidates will answer questions. The public is encouraged to attend and submit written questions. Questions are screened by a panel of League members and presented to the candidates by a moderator. Other candidates may be present for a brief introduction only. The League of Women Voters is a non-partisan organization with the major purpose being to inform voters about the candidates and issues. Further information about the Candidates Night may be obtained by calling Voter Service Co-Chairs Holly Finnarn at 937-417-4483 or Eileen Litchfield at 937-623-1234.